Off to the beach, the pool or a picnic? A stylish tote is a must and the timeless theme of this nautical-inspired bag will make you stand out from the crowd. 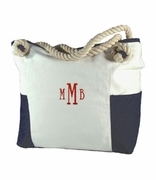 The bag features a classic design of ship's ropes in navy and white with a touch of hot pink for a fun look. The bag has one large easily accessible main compartment. It has strong carry handles, is fully lined and re-enforced along the base, ensuring that this will accompany you on many memory-making outdoor events. Our collection offers a matching accessory bag search item WB-M230TIED and towel search item WB-M1015TIED in the same design. 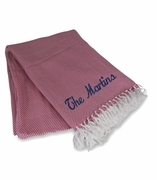 Personalize them with the monogram of a loved one and you have a very special gift idea!